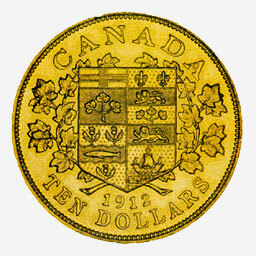 During the first 40 years of its existence, the Dominion of Canada had no gold coinage of its own although various foreign gold coins, notably British sovereigns and several United States denominations, were used. Late in the reign of Edward VII the government decided Canada should have its own gold coinage, and the initial steps for the production of $2 1/2, $5, $10 and $20 pieces were taken. George V, however, was on the British throne by 1912 when the first Canadian gold coins were actually produced for circulation. From 1912 to 1914, coins were produced and issued, but only in the $5 and $10 denominations. Many of these coins were held in the government's gold reserve and did not circulate, as the public need for them proved to be slight. Eventually it was decided that gold bars were a more convenient form in which to hold government gold stocks, and since 1914 no gold coins have been struck for circulation. The attractive designs for the reverses of the 1912-14 coins feature the coat of arms of the Dominion, containing the arms of Ontario, Quebec, Nova Scotia and New Brunswick, which was in use from Confederation until 1921. The arms are surrounded by maple leaves. The coin illustrated is part of the Bank of Canada's National Currency Collection.